The Turkish Cuisine is full of healthy, simple and fresh dishes. Zeytinyağlı Pırasa was one of the first “olive oil” dishes I was introduced to by my Mother-in-law, over a decade ago on my first visit to my husband’s homeland. I LOVE leeks and I LOVE olive oil. It was a match made in heaven! This dish is traditionally served cold, so it’s perfect for a picnic on a hot summer day and it’s loaded with nutrition Folate, Vitamin A, Vitamin K, Calcium and Omegas! Trim and clean your leeks, then chop them on the bias about 2 inches thick. Peel and cut the carrot on the bias about 1/4 of an inch thick and finely dice your onion. 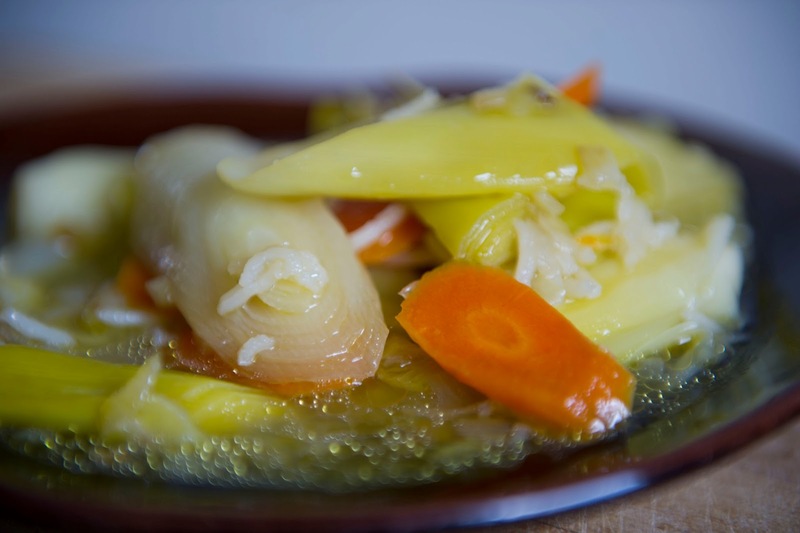 In a deep pot, saute the onions for a minute, then toss in the carrots for 3 minutes, then add your leeks, rice and sugar and allow them to cook covered, in their own juices, on a medium heat, for about 5 minutes. Add the water and stir. Bring it back up to a boil, then turn the heat down to a slow simmer, cover and cook for about 20 minutes. (Make sure not to stir the pot so the leeks will hold their shape!) When the timer goes off, allow it to cool in the pot so all of the flavors can continue to blend. Once cooled, squeeze some lemon over the top and enjoy! Side Note: This dish is good in the fridge for up to 3 days and is definitely tastier by the second day! ← 3 Places to Explore with Kids While Beating the Southern California Heat!